Photograph, 'Reactor' by Jonathan Waring. Graham Dunning is self-taught as an artist and musician, having studied neither discipline academically. He has performed solo and in ensembles across the UK, Switzerland and Norway, and shown solo sound installations in the UK, New Zealand and USA. 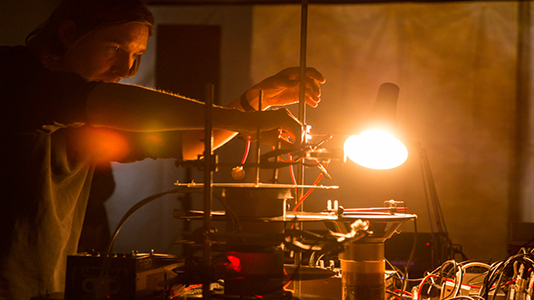 He teaches Experimental Sound Art at the Mary Ward Centre in London and also gives various independent workshops. Dunning has solo releases on Entr’acte and various DIY labels. He performed Mechanical Techno at Magnetic South 2016. Graham comments on his work as an artist. "As an artist I make things in various different formats, but generally to do with either Sound or Found Objects. "My background is in experimental music and this continues into the art I make and how I go about it. I use experimentation and play as a main part of my making process. I also like to set myself restrictions for my projects similarly to the way scientific experiments are conducted. Noise – as unwanted sound like record crackle or tape hiss – often features in my work, and a visual equivalent in dirt, dust or decay. I often try and repeat a visual process with audio, and vice versa. "My work explores time and commemoration: how people store their memories, in personal archives – photographs, audio journals, post-it notes – and what becomes of those archives. I find discarded objects interesting in themselves, for the stories that they suggest or that can be read into them. Collecting things has always held a fascination for me, both to do myself and to look at the way others do it."